Farmers in California’s Sacramento-San Joaquin Bay Delta have come to an agreement with the State Water Resources Control Board: in exchange for the Board’s promise to not implement stricter cuts later in the season, some growers have agreed to voluntarily cut their water use by 25%. The Board was expected to impose mandatory cuts to senior water rights holders in the San Joaquin River watershed. These users have not received curtailment orders since 1977. Historically, the Board has had limited ability to monitor the use of these senior rights holders. Last week, Governor Jerry Brown released a revised budget that includes a provision to require water rights holders to track and report their water usage to the state each year. Until that happens, the Board will enforce curtailment through farm visits, measuring river flows, and the honor system. Wildfire season officially began earlier this month. Since the beginning of 2015, California Department of Forestry and Fire Protection (CAL FIRE), has responded to over 1,406 wildfires across the state, up from a five-year average of 854. These fires have burned more than 6,000 acres, up a five-year average of 5,475 acres. This is a low estimate of the true fire damage in the state, as these numbers do not include fires outside of CAL FIRE’s jurisdiction. The International Research Institute for Climate and Society has increased the probability of El Niño weather conditions to more than 90% through August, up from April’s forecast that estimated a probability around 70% through July. 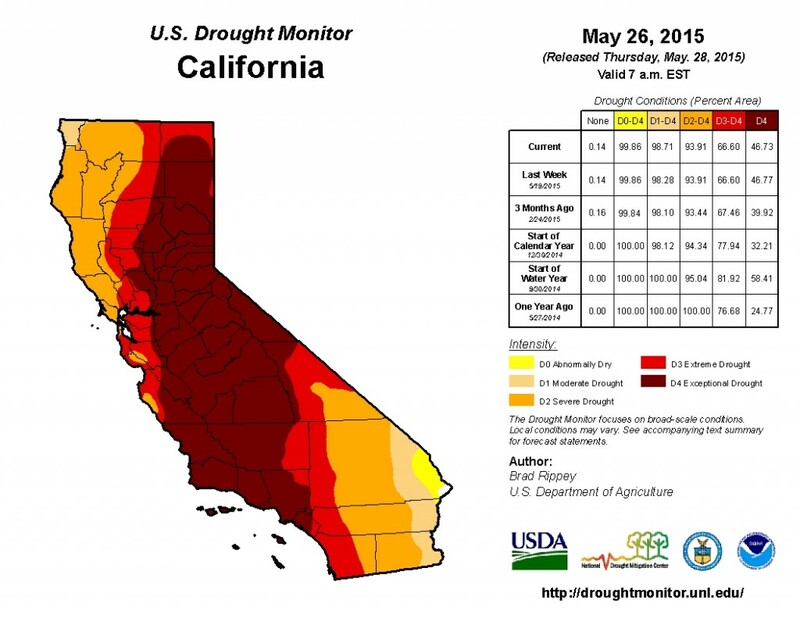 Still, this does not necessarily spell drought relief for California. 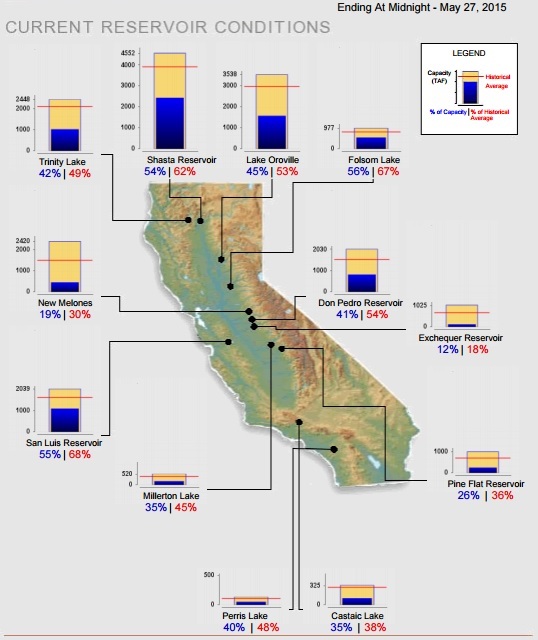 Statewide, California’s major reservoirs (representing 26.3 million acre-feet of storage) are at 43% of capacity and 55% of group average.